The successful treatment of a massive brisket wound on a police horse that was hit head-on in a traffic accident in Nigeria has been described by the vets who treated the animal. They have described their treatment of the seven-year-old stallion in a case report in the International Journal of Medical Reviews and Case Reports. Wounds were the most commonly encountered injuries in equine practice and could be challenging to treat, the authors said. The stallion, reported as being of the local Dongola breed, was taken to the veterinary teaching hospital at the University of Ibadan following the road traffic accident. The horse, owned by the mounted department of the State Police, was being ridden on the highway when it was involved in a collision with an on-coming vehicle. There was a dramatic shearing off of the skin and there were two open wounds in the right tibial region just below the elbow joint. The horse was also favouring both hind limbs. The animal received 15 litres of intravenous fluid. Hewas given painkilling medication and sedatives, and underwent surgery. The wounds were thoroughly irrigated with normal saline to remove all dirt and all loose and unviable flesh was trimmed. The exposed muscles were stitched closed layer by layer. The edges of the skin flap were trimmed and closed with nylon stitches. The two open wounds on the right tibial region just below the elbow joint were also sutured. After the surgery, the horse received tetanus toxoid and injected antibiotics. The stitches were removed a week later as recovery continued. 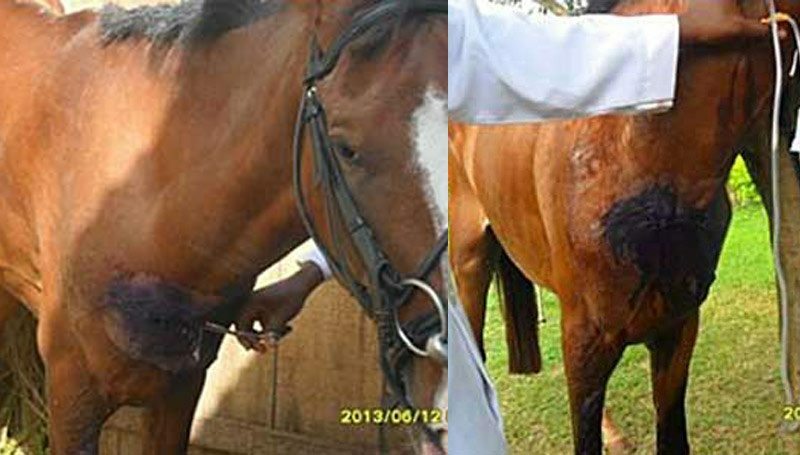 “Careful management is important for successful treatment of horse wounds,” veterinarian A.K. Olaifa and his colleagues said. “Wounds should be assessed quickly and carefully and aseptic surgical techniques meticulously employed. Post-operative care was done conscientiously and appropriate antibiotic treatment regimens employed. “The incidence of wound infection appears higher in horses than in small animals and man,” the authors noted, citing previous research. The case report, published under a Creative Commons License, can be read here.